Reubens! 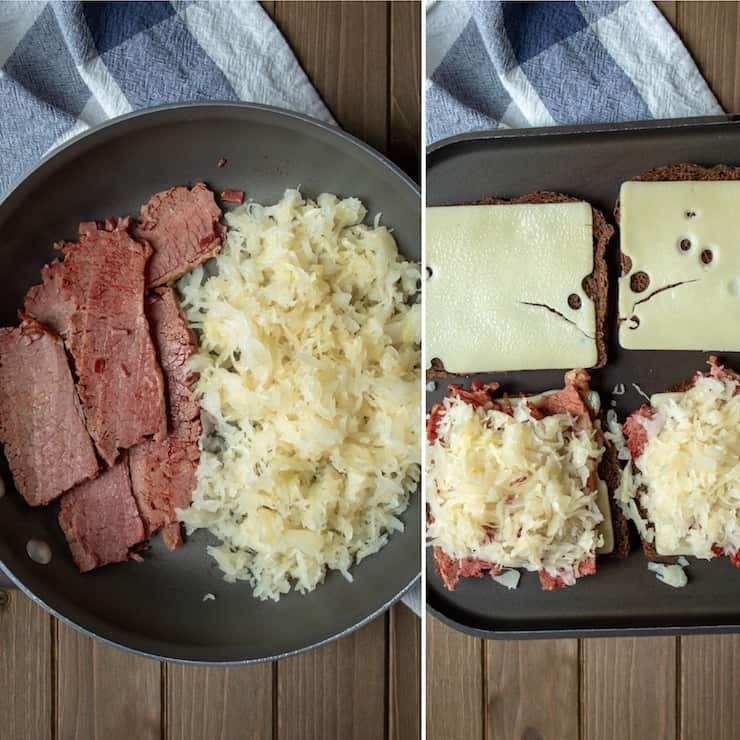 Classic grilled Reuben sandwiches, with corned beef, sauerkraut and Swiss cheese, the best part of leftover St. Pat’s day corned beef! 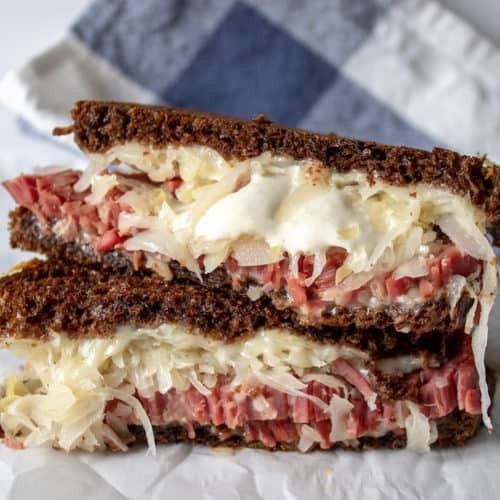 Every year after St. Patrick’s Day I want to make grilled Reuben sandwiches with the leftovers, and every year there are no leftovers. Not this year because I hid some corned beef so Meathead wouldn’t eat it all. I had enough for two loaded reuben sandwiches. Finally, after all these years. 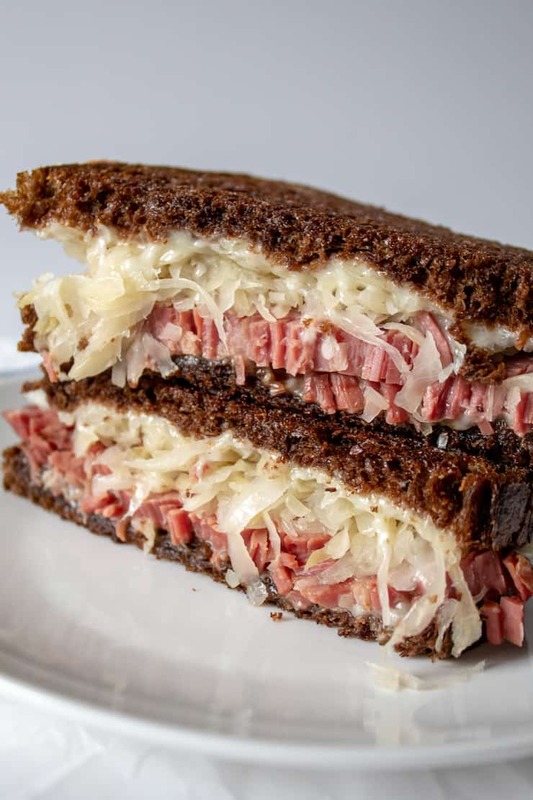 When I was a kid, I loved Reubens. When we went to a local “joint” near Chicago called Harvey’s, I almost always ordered the Reuben. 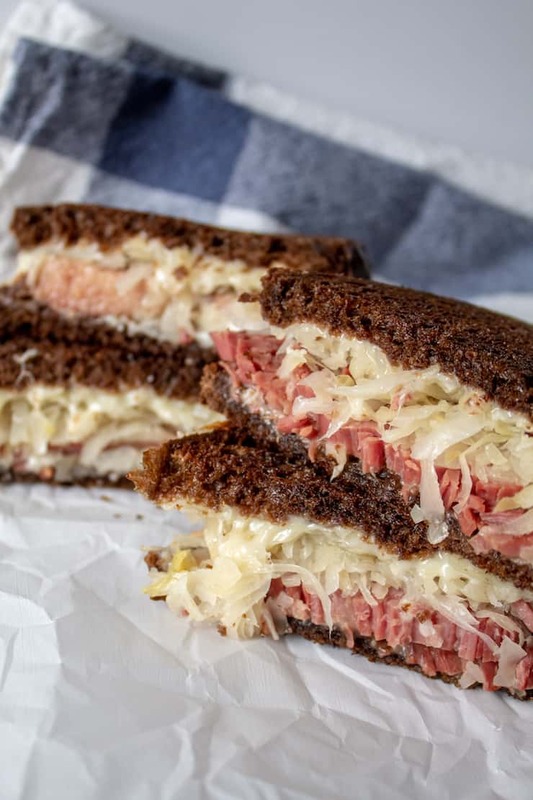 Mounds of corned beef, melty Swiss cheese and sauerkraut. No sauce came on these and over the years I grew to like 1000 Island dressing on my Reuben. Now I like a swipe of the leftover horseradish mustard sauce. I think sauce is a preference or a regional thing. You can check out how I make corned beef and cabbage with these two recipes, one in the Instant Pot and one on the stovetop, both delicious and include instructions for making the horseradish cream sauce. 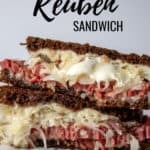 If you’ve tried these Reubens, please rate it below in the comments and let me know how it went ~ I love hearing from you! HUNGRY FOR MORE? Subscribe to my Newsletter and come hang out with me on PINTEREST, INSTAGRAM and FACEBOOK for all the latest updates. UPDATED March 1, 2019: no changes to original recipe, just made things look a lot nicer. 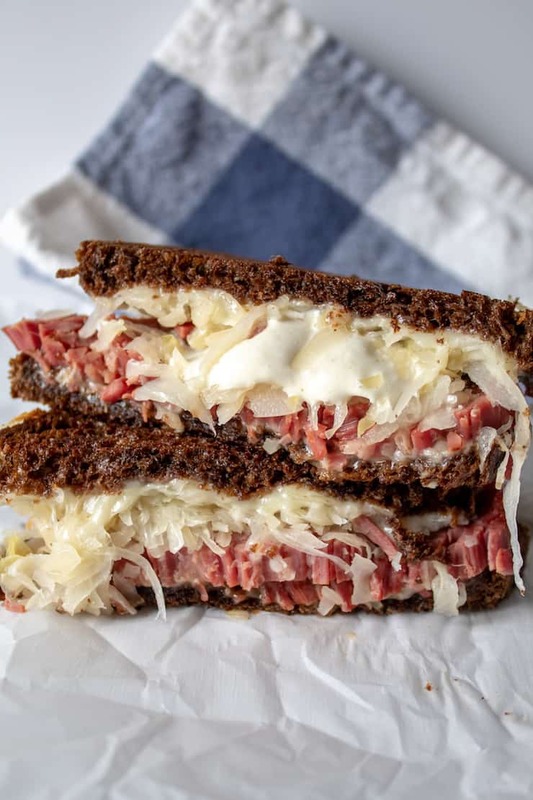 How to make a classic grilled Reuben sandwich with corned beef, sauerkraut and Swiss cheese. 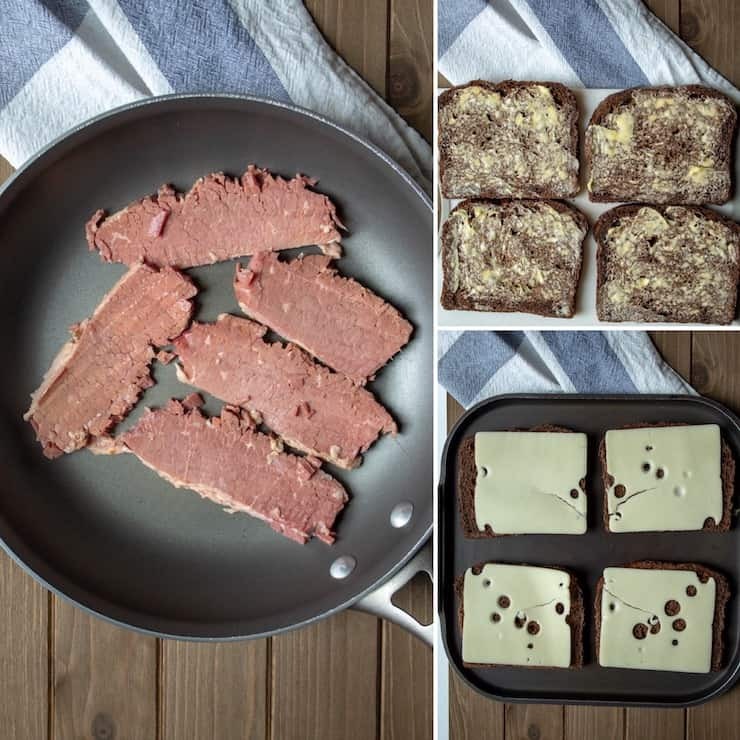 My favorite way to use leftover St. Patrick's Day corned beef. Thinly sliced corned beef, about a ½ lb. or more, your preference, the more the better, I say! You'll need two skillets. In one skillet, place the corned beef and heat, flipping occasionally until heated through and some pieces are lightly browned and crispy. Push the corned beef to the side and add a large mound of the rinsed and drained kraut. Heat and flip the mound a couple times. Meanwhile, butter one side of each piece of bread and place on a heated grill pan. Top each slice with 1 slice of Swiss cheese. The bottom should get nicely toasted, but not burnt, and the cheese should start to melt. Pile corned beef on two slices of grilled bread/Swiss. Top with a generous amount of sauerkraut. Add sauce of choice, or not, and then top with remaining two slices of bread/cheese. Heat on low and cover with a lid if you can to make sure it's all melty. You can find the recipe for the horseradish mustard cream sauce here. Quite possibly the greatest sandwich ever devised by mankind.